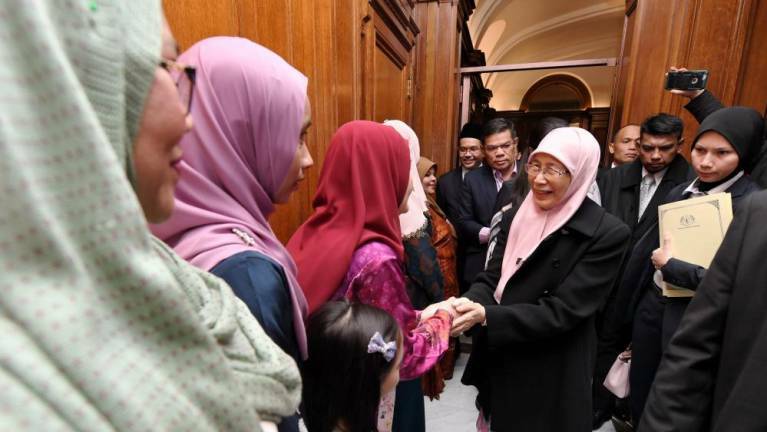 07 Dec 2018 / 11:50 H.
LONDON: Assuring that the Pakatan Harapan-led government is making recovery of the nation as the number one priority, Datuk Seri Dr Wan Azizah Wan Ismail said the reforms will and must benefit all Malaysians. The deputy prime minister said the institutional and structural reforms undertaken by the government will take the nation to the path of recovery and that the government will manage Malaysia for all Malaysians, and not just for the privileged elites. “The benefits should be shared fairly for all Malaysians to grow and fulfil their fullest potential. 2019 onwards must be a recovery year for the many, not the few. Inclusivity is the raison d’etre of this government and we are serious about delivering this for all Malaysians,” she said at the Malaysian diaspora dinner held at the Malaysian High Commission here Thursday night. The deputy prime minister, who is on an official visit to United Kingdom since Wednesday, said Malaysians abroad not only have a role to project good image, but also have crucial role to play in rebuilding the reformed Malaysia as the future of the nation rest on its citizens and the choices they made. “It is your business to force reforms for rule of law, good governance, integrity and efficiency from the administration. It is your duty to insist upon protection of human rights. It is your place to voice out opinions and ask for better quality of life, environment, cities, and opportunities for all Malaysians. Be your own hero in the history of Malaysia for the years to come,” she said. The Malaysian first woman deputy prime minister said the nation needs not only a strong economy, but also a strong community that is committed to ensuring all Malaysians get a good start and a fair go in life, having their needs of housing, healthcare, education, work-life balance, dignity and security. Dr Wan Azizah said the seven-month old government cannot effect change on its own and that all Malaysians need to give the government, that was built on an alliance of hope in May 2018, the chance to deliver. “Whatever misgivings and anger you had in the past, I hope they will be buried so we can work together and make Malaysia better, happier, and safer .... I am prepared to be in the service of putting Malaysia’s long-term interests before popularity. I urge all of you to join me on this journey.